The California Department of Technology (CDT) conducts independent project oversight on medium and high criticality reportable information technology (IT) projects for departments and constitutional offices (Government Code § 11546, et al). The IPO managers are embedded in the project, review and monitor project health; create project oversight reports; escalate project risks and issues; and assist project staff in developing appropriate risk and issue mitigation strategies. IPO managers work hand-in-hand with Independent Validation and Verification (IV&V) services, which is to assess the quality of technical deliverables, as the checks and balance role for project oversight. The Independent Project Oversight Report (IPOR) is issued on a monthly basis to the project steering committee and project sponsor – depending on the complexity of the project. The IPO Manager also provides a written report (score card) at each project steering committee meeting. Evaluates the strength and health of the project throughout its duration by attending project meetings; reviews project plans, documents, reports and processes; and collaborates with the IV&V expert and the project management team. Identifies and reviews project issues and risks and provides feedback on the mitigation strategies developed by the project management team. Compares actual project status to the planning assumptions approved through the Project Approval documents. Issues a written report (IPOR), which is an Independent objective third party assessment of the project’s health and progress. Provides written reports (score card) at each project steering committee meeting to ensure all oversight parties and executive stakeholders are informed of project status and progress. Reviews and provides feedback on project approval requests and project planning documents. Escalates, tracks, and monitors project risks and issues. CDT requires departments to do comprehensive upfront planning with an emphasis on establishing a strong business case before a project is approved to move forward. The PAL is nimble to meet the individual needs of departments and provides a guided approach for projects to follow, as well as an objective and consistent evaluation process. PAL is designed to improve the planning, quality, value and likelihood of IT projects success. IPO Managers work closely with agencies/state entities to assist departments in completing the required material for project approval and to ensure project proposals and plans are well thought out and clearly indicate programmatic benefits. This process includes evaluation of organizational capacity, capability, and readiness for project management. It also involves the evaluation of the sufficiency of market research and the thorough consideration of feasible alternatives which address the identified needs and benefits of the project. The IPO Manager ensures that the State entity is addressing all planning needs consistent with statewide strategies, policies, and procedures and is progressing through the project approval process on a schedule appropriate to the project’s objectives. The PAL process is divided into four stages, each separated by gates of approval. Evaluates completeness, the sufficiency of the business case and – whether or not the concept aligns with department and agency priorities. Ensure sufficiency of planning, organizational readiness and good documentation resulting in sufficient market research, alternative analysis and justification for the selected alternative. Specify business level requirements, develop the procurement documents and assemble the solicitation package. Select vendor, contract award, update the final budget, project plans and schedule. Once the project is assessed for final readiness, it could be approved for execution. Conduct procurement while continuing with project readiness tasks. For “reportable” IT projects through PAL, the Project Approvals and Oversight assigns resources when the customer commences the development of content for the Alternative Analysis Stage (Stage 2). The Project Approvals involvement will continue through the Procurement Analysis and Solutions Analysis stages. The Project Approvals assists customers in completing the necessary tasks to sufficiently plan their IT project, in order to receive final project approval from the California Department of Technology at the end of the Solutions Analysis Stage. The PAL monthly Assessment Rate is generally charged for project proposals at the start of the Alternative Analysis Stage through the end of the Solutions Analysis Stage. The Project Approvals and Oversight service offers the unique ability to leverage statewide experience to assist state entities through the many challenges that state projects often face. IPO Managers provide feedback to departments to help plan and monitor projects and to bring projects to successful deployment. The Project Approvals and Oversight focuses on ensuring that the scope, schedule, and costs associated with each project are adequately defined, planned, and monitored. 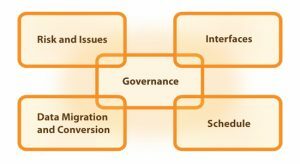 Governance: How is the project structured? Are decisions made timely at the appropriate level of authority? This includes not just the plan for action, but the action itself. Execution of governance (such as escalation plans) can ensure issues are addressed timely and escalated to the appropriate authorities to reduce risk to the project portfolio. Risk and Issues: What are some of the risks and issues affecting the project’s success? Are they properly identified? Who is allowed to raise risks and issues? How is it done? Are risk mitigation and issue resolution strategies identified, appropriate to the issue, deployed, and managed? Interfaces: Will the (new/enhanced) system interface with another? Who owns the system? Does this require data sharing with other (federal/state/local) agencies/entities? Data Migration and Conversion: This is often the driving force behind an IT Project; is there a requirement to migrate and convert vast quantities of data? Has all the data been properly identified? Is data cleanup required? Will conversion occur prior to migration? Parameters are critical here, as are time frames. Schedule: A baselined and fully resource-loaded schedule is necessary for thorough project planning. Is the schedule being maintained to show actual completion dates, and thus start dates for dependent activities? Does the schedule properly identify all predecessors and successors? Who do I contact to learn more about IT Project Oversight services? Please contact the Independent Project Oversight (IPO) Manager assigned to your organization. Who do I contact to learn more about IT Project Approval Services? Please send an email to ProjectOversight@state.ca.gov. Services are billed directly through the customer’s monthly invoice and payment for these services are processed via direct transfer. The CDT Account Lead can assist customers with opening a Service Request.